The mandore — known as the mandorre in France, mandora or mandola in Italy, quintern or mandörgen in Germany and mandour in Scotland — is an instrument which combines the characteristics of both the lute family and the mediaeval gittern. For its ultimate origin, we start all the way back with the Arabian gut-strung oud, which has been played for so many centuries that its origin cannot be securely dated, possibly as far back as Pharaohic Egypt. The quill-plucked oud entered Europe in the second half of the 13th century and Europeans soon developed it into the mediaeval lute, also strung with gut and plucked with a quill. In 1481 this developed into the finger-plucked renaissance lute, made in a range of sizes, from the large bass lute to the small treble lute. Alongside the oud, mediaeval lute and the early life of the renaissance lute there was the gittern, which looks similar to the smaller members of the lute family except for two key characteristics: the backs of ouds and lutes were made of several ribs glued together, whereas the bowl-back of the gittern was carved from a solid piece of wood; and because the lute has a neck attached there is a definite line where the neck meets the body, whereas the gittern, carved from a single piece of wood, has a continuous contour with no body/neck distinction. And so we come to the tiny mandore, with a length that measured typically around 50cm, the same or similar size as the gittern. It was particularly popular in France, Scotland and Germany, and flourished from the early 16th century, just after the gittern died out: the mandore may therefore simply have been a new name for or a development of the gittern, but this cannot be stated with absolute certainty. The mandore existed in two physical forms: carved-back with the gittern shape; or rib-back, with the lute shape. There were several tunings which combined intervals of fourths and fifths (we don’t know what gittern tuning was to be able to compare); or tuned relatively the same as the first 5 courses of a renaissance lute, but at a higher pitch. It could be played with a quill or with finger-tips and it had 4 or 5 courses like the gittern; or 4 or 5 single strings; or a combination of single strings and courses. The first evidence for the instrument is in Sebastian Virdung’s Musica getutscht of 1511. Published in Basel, Switzerland, it is the earliest western printed treatise on musical instruments and includes a labelled woodcut of a rib-back 5 course “quintern”. Printed books and written manuscripts of mandore tablature provide further evidence of its use and popularity, from a lost French book by Pierre Brunet, 1578, to other French, German and Scottish music with distinct national musical characteristics, through to the last surviving mandore music in the English Talbot manuscript (which also includes lute and cittern music) of circa 1695. We also have some beautiful surviving examples of 17th century mandores from France, Italy and Austria, of both the carved-back gittern and rib-back lute type. One example is at the top of this page. 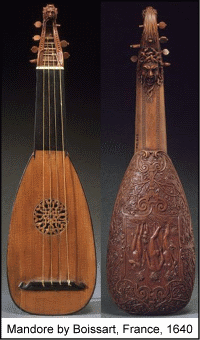 A distinctly Italian version of the mandore with its own tuning was developed from around 1650: the mandolino, i.e. small mandola (mandola being the Italian mandore), which was the beginning of the mandolin. Mandore playing I mett her in the medowe, anonymous, from the Skene mandore book, Scotland.